Its not about buying and selling. Today’s trading industry is all about competition from every corner. Some of the major hurdles come in terms of waning principal loyalty (multiple vendors for the same product/brand), disappearing geographical lines and exploding online retailers among others. These challenges call for the need to integrate and streamline businesses in order to become leaner and more profitable. Greater visibility and transparency can be achieved by automating the processes, connecting branch offices, warehouses, service centers, etc,. Say goodbye to the high cost and complexity of point-to-point integrations. Welcome to a single integration solution that quickly connects your system or applications without manual intervention. Systech ERP has established the mission of helping the small and medium business owner’s dreams into reality by leveraging the technology to their day-to-day operations. Welcome your customers and excite them to board-in, by your prompt response. Organize your prospects genre-wise, industry- wise and keep them engaged with valid newsletters and campaigns. Manage inbound leads and outbound efforts to create leads in a never before manner be it a simple telecall or a marketing event . Instant sales proposals, effective sales force, etc prove your mettle. Funnel management keeps the right forecast for you to plan your inventory and resources. Systech ERP copes with varied product lines within the trading industry and offers operational excellence exclusive to each one of them. An FMCG business enabled with integrated TW App helps the salesman-on-the-move deliver goods, raise sales bills, receive payments and book sale orders. Similarly for an after-sale-support trader, it offers serial number management with warranty tracking and an automatic update of the support vitals. A pharmaceutical or food distributor would be happy having the batch and its expiry management. Not all that, multi level price-lists, exports & imports, simple assemblies or product conversions, secondary sales management and the list goes on. Our credit management system keeps a check on every customer with respect to the debt value and the outstanding due. You can track profitability on every sale,every item/group and every customer. 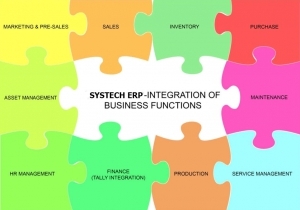 Systech ERP administers all types of sales whether it is purchase-to-order, purchase-to-stock or even a sale-on-transit. Our web based capability connects all your locations together thereby reinforcing the comfort of all under one roof feel. Business Analytics using dashboards help you take informed business decisions. It helps look at multi dimensional analyses with respect to customers, items, employees and agents. Customer complaints management achieved by tracking and closing customer issues in a swift manner. This results in high customer satisfaction levels making them to come back and bring a lot more references. Systech ERP offers the following modules for the industry, not on a generic basis but tailor made to each and every domain within the industry. Systech ERP,a ground breaking platform for the mobile world, gives you access to your business information as easily as if you were at your desk. It can be accessed from your mobile browser or by our exclusive apps developed for a specific purpose.